Now in its 24th year! This course features lectures and demonstrations about a wide range of alternative therapies, taught by experienced practitioners. Students have opportunities to visit an integrative/alternative-care practice, interview patients and/or providers, and experience CAM practices. If you are not a UNC Student, you may take this course, free of charge. Registration is required! Purpose of Course: This course is designed to introduce medical students, other health professions students, faculty, health practitioners, and researchers to the philosophies, practitioners, techniques, and evidence of efficacy of complementary and alternative medicine (CAM) therapeutics currently in use in the United States, including chiropractic, dietary, mind-body medicine, acupuncture, homeopathy, healing touch and energy therapies, prayer, and herbal therapies. A large and growing percentage of Americans use one or more of a wide range of complementary, alternative or unconventional healing therapies, often in addition to seeking advice from physicians. Increasingly, research is showing efficacy for many of these therapies. Ability to understand and communicate effectively with patients and other care providers about these therapies should enhance patients’ health and safety and optimize health care. Describe the knowledge, attitudes, and skills necessary to communicate effectively with practitioners and users of CAM and conventional therapies. 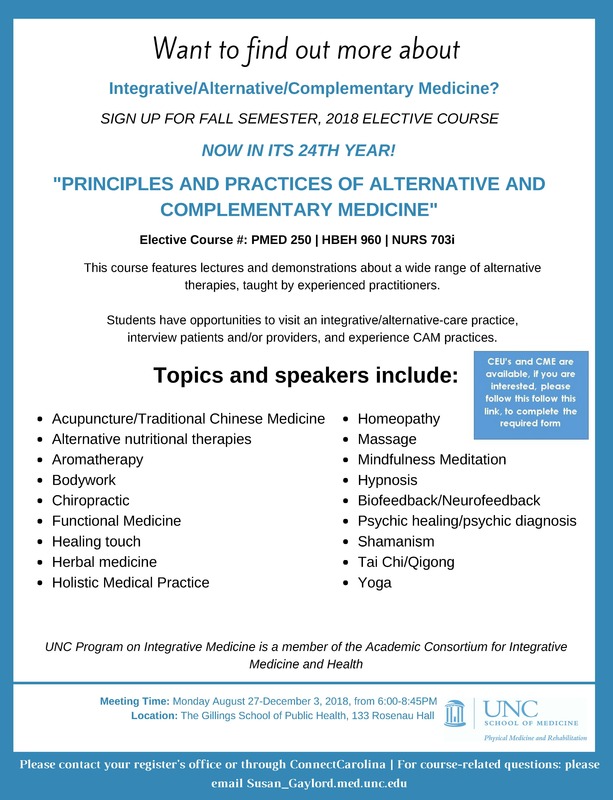 Format: The course provides an introduction to the field of CAM and integrative health-care, including a wide range of alternative modalities, in lecture-and-discussion format, presented by an active practitioner of the therapy and/or a person knowledgeable in the field, with patient presentations, demonstrations and audience participation where applicable. Presentations cover diagnostic methods, treatment, evidence of efficacy and safety for various conditions, training of practitioners, the practitioner-patient relationship, patient satisfaction, role of prevention, and potential for interactions with conventional healthcare. Topical readings supplement lectures and demonstrations. Expand your repertoire of clinical tools to deal more effectively with patients who have complex autoimmune diseases, chronic infections and other chronic illnesses. Highly research oriented. Focused on identifying appropriate physiological targets and choosing appropriate tools with which to address them. Diagnostic and therapeutic topics are discussed in the language of physiology. Powerpoint driven, with virtually slide a quotation or diagram from a peer reviewed study in the medical literature. Focus is “additional tools that are compatible with what you’re already doing” rather than “use this instead of a conventional approach”. Includes functional medicine misconceptions for you and your patients to avoid.